We, Axcel Gases along with our associated company are a renowned Hydrogen gas manufacturer, supplier and exporters in India. Hydrogen Gas is tasteless, odorless, colorless, non toxic, non metallic and highly flammable gas. It is the lightest element available on earth. Most of the Hydrogen present on earth is available in molecular form in water and organic compounds. It has a boiling point of -252.8°C (-434.9°F). Commercial Hydrogen Gas is produced from Hydrocarbon by steam structuring of natural gas. 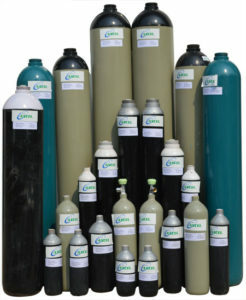 It is then filled and stored in Hydrogen Gas Cylinders for any further industrial/lab grade applications. 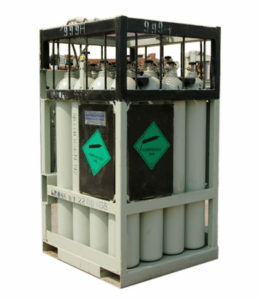 For some applications where continuous and high quantity of Hydrogen gas is required to be feed, We make use of H2 gas cylinder quad which is nothing but number of cylinder interconnected and having common outlet. For different type of Quad. Hydrogen gas is available in different purity grades and concentrations to meet the specific requirement of diverse industries. We have in house laboratory equipments to check the level of purity as well as various impurities present in it. Hydrogen, due to its highly reactive nature, finds huge application in chemicals as well as oil and gas industry for making various chemical compounds. As a main ingredient in Ammonia production. As a main equalizer for saturation of unsaturated fats in oil industry. As a shielding gas when mixed with Argon or Nitrogen to shield Oxygen reactive materials from the air or moisture present in Air. As a coolant in power generation plants. As a gas in sky balloons or other equipments to lift the same in atmosphere because this gas is lighter than air. As a mixture gas in plasma cutting and under water cutting. As an alternative source of energy for vehicles and other energy consuming equipments. As a fuel in aeronautical or space craft industry. These are some of the common uses of Hydrogen. There are various other ways in which Hydrogen can be used in a particular industry or process.